For the best performance this kit should be installed by someone with automatic transmission experience. We recommend following a transmission repair manual for disassembly and assembly, which BTE can supply you with. The Super Bracket kit functions in low gear when brake button is activated. This kit is not designed to repair a transmission that is not working properly. STEP 1: Please remove the following items: pan, valve body, tail housing, governor support, front pump, band, clutch drum, planetary, reverse clutches, reverse piston and detent plate. STEP 4: Completely clean case to remove all aluminum shavings. STEP 5: Discard stock detent plate on Super Bracket valve body. Super Bracket Brake design does not require this stock item. Install reverse piston. Next, install steel clutch plates as needed for poper clearance. Five (5) frictions and five (5) steel are usually required. DO NOT use the wavy cushion plate, if equipped. Clutch clearance should be .060" to .070". STEP 6: Inspect high gear clutches. If there is a wavy cushion plate present, replace with two (2) flat steel clutches. Clutch clearance should be from .050" to .070". BTE can supply you with a racing clutch pack. STEP 7: Before assembling transmission discard: Governor assembly (if equipped), rear pump gears (if 1962-66 model), vacuum modulator, modulator valve and spring. Governor support must be left in transmission. Shorty transmissions, discard: Governor support. Use round governor support gasket to seal rear of case. STEP 8: Install servo tube, OEM manual control valve and valve body. STEP 9: Torque valve body bolts to 16 foot/pounds. STEP 11: Connect Solenoid to the Trans-Brake microswitch button using a 12-gauge wire. 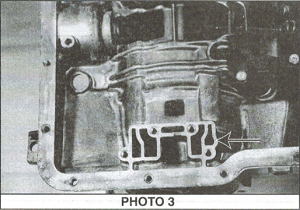 STEP 12: Adjust low band and fill transmission using a dextron type F transmission fluid. BTE can supply you with racing transmission fluid. DO NOT OVERFILL! Band adjustment: 72 inch/pounds and back off 3 1/2 turns. BTE can supply you with a Racing Kevlar Band. STEP 13: The Super-Bracket must have a 12-volt battery fully charged at all times for solenoid to work properly.STEP 14: A transmission cooler is required for heat reduction or you will shorten the life of your transmission by 50%. BTE can supply you with the correct cooler.